I interviewed Rick Daley at the A to Z Blog today – his theme for the Challenge was movies! (And you know how much I dig movies.) Stop by today and check out his interview. Brought up in a religious home, Sophia believes the only way to have a forever family is by following church leaders and obediently choosing the right. She goes to the right school, marries the right man in the right place, and does the right thing by staying home to raise her children. But when she starts asking questions about grace, love, and the nature of God, she realizes her spiritual struggles could rip her family apart. If you have any questions for Sophia L. Stone, her Twitter account is sophia stone@ask_a_mormon - and you can use the hashtag #mormonquestions. You can purchase the book at Barnes and Noble and Amazon, and view the book trailer on You Tube. Sophia, good luck and I wish you much success! Ninja News – all about the ladies today! Suze’s entry for a major writing competition won first place. And she was at the banquet when they announced it. Can you imagine that thrill? Way to go, Suze! Tyrean Martinson’s poem, "March Snow Hare," is included in the recent release of The Best of Every Day Poets Two. For more information, visit the release page at Every Day Poets. Tyrean, congratulations! Karen Gowen at Coming Down the Mountain just released her new book on Tuesday, Lighting Candles in the Snow. Congratulations, Karen! Just – wow! A hundred and seventy-eight of you participated and it was just incredible. Somehow I managed to visit every single one plus some of my regular blogger buddies on Monday. And my apologies to those I missed – not enough hours in the day! Thanks to those who commented - over two hundred! Almost broke the record. So many of you visited others on the list, and I really appreciate that. 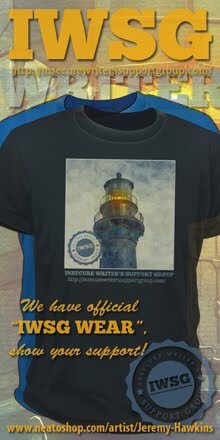 Special thanks to Jeremy, Nancy, and Kyra - I saw your comments everywhere! All links lead directly to the blogfest post, so feel free to continue exploring. Thanks everyone for making this the best blogfest ever! 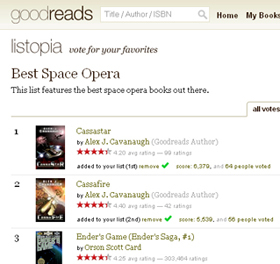 And a big thanks to everyone who voted for CassaStar and CassaFire on the Goodreads Best Science Fiction Space Opera list! It won’t last, but they claimed the top two spots! Hopefully they can hang around the top five for a while. But it wouldn’t have been possible without your support. You guys rock! The remake of Clash of the Titans was so awful, I avoided this sequel in the theater. Safe to say, this one is much better. Still not great. Worthington still can’t act to save his life. But three things made it better than the first one – it wasn’t a remake of a beloved classic; it actually had a soul and some humor; and the special effects were amazing. Worth a rental even if it won’t really stick with you for long. 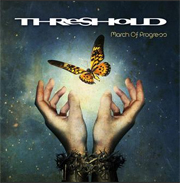 The ninth studio release of this progressive rock band is definitely their best! Former lead singer Damian Wilson returns after doing several side projects, including working with prog master Arjen A. Lucassen – and the influence of Lucassen really shows. There isn’t a bad song on the disc. The melodies and vocals flow together perfectly and the songs are very accessible. The guitar and other instruments are so crisp – one of the best mixed albums I’ve ever heard. For those of you wanting to sample prog rock or expand in the genre ( Jamie! ) I’d highly recommend this disc. Curious to know more about Sophia’s book? Excited for the new releases? Seen Wrath of the Titans? Picked up March of Progress? (Still wondering what the heck is progressive rock?) And did you have a good time with the blogfest? I hate to be that person, but you spelled "Wrath" as "Wraith." I'm not sure if this is deliberate since it was done four times, but I thought I should point it out. The bloghop was everywhere, nice work. Don't know if I'll see Wrath, managed to avoid Clash and don't regret it. Charles, just a typo, as I put this one together late. Moody, you are lucky you missed it. Congrats to everyone (I would go through everyone, but my kids are waking up). Wow! A big congrats. That cover for 'The Mormon Diaries' is excellent, and the subject matter and review is intriguing. Thank you for featuring Sophia's book. And thank you, Alex, for mentioning my win. You are so gracious. May God bless you many times over. Thanks for including me in the A-Z review, I had a blast participating! Isn't the Mormon Diaries a smash Broadway play? Oh, wait, that's the Book of Mormon. This probably has a slightly different tone. I am one to question everything and I'm a Catholic-converted-to-agnostic, so I can empathize with the spiritual struggle. I thought Sam Worthington did all right in Avatar, but that may have been a role made for him, like Keanu Reeves in The Matrix. I haven't seen either Titans movie, but I like the original. Congratulations on getting the top spot at Goodreads, great accomplishment! Loved being part of the Genre Favorites Blogfest, lots of interesting choices were made by my fellow participants! Thanks for hosting Alex. I enjoyed the blog hop, I hadn't done one in a while and it was fun. Sophia's book sounds intriguing, can't wait to read it. Suze, you are welcome! Hope I worded it right and sorry I didn't know the name of the writing contest. Rick, you're welcome. And Cameron must've just known how to bring out the best in Worthington. Thanks, CM. And glad you enjoyed the blogfest. Blogfest was super. You can't imagine how much I needed that. Definitely want to read Sophia's book. Thanks for the 'heads up'. 'Titans', I don't think so. Progressive Rock - ELP, was about as far as I ever got. Ha, ha, ha. Wrath of the Titans was a boring film and a waste of time. I hate films are full of dark scenes, you see nothing, just dark spots and shadows. WRATH!!!! The special effects are super! That keeps me intrigued for sure. Congrats on the Goodreads success! You are such an integral part of the blogging community, Alex, and give so much back to your fellow writers with your Ninja News! Love that the blog hop was a huge success! 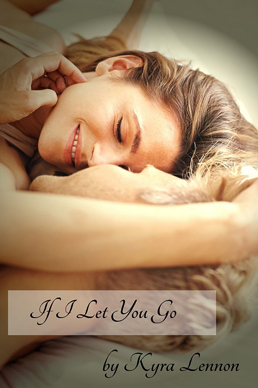 And I am so proud that your books claimed the top two spots on the goodreads list. That is awesome. Congrats, Alex. I saw Wrath of the Titans and thought the same thing, more or less. I was stunned at how much better it was than the first one. Still not great, but very watchable. Loved the fx. And Threshold! They stole that band name from me! Well, probably not. But still, that was the name of the band I was in back around '91 or '92. We sucked. But wow. I probably have some mock-up album covers around here somewhere... I'll give this a listen. I loved the blogfest, I really should have did some more visiting. But these days it's all I can do to even log in. Thanks for hosting. I'm glad the bloghop was such a success. Congrats on your rise on goodreads, too. That's awesome! I'm still hiding under my rock in utter shame and embarrassment after my monumental mistake in posting about Sophia's book!! Lovely Sophia!! Back under the rock I go! Still working my way through the blogfest,it is a fun one and meeting new bloggers is half the fun! Faraway, glad it gave you a boost. JW, just watch the original. You really don't want to see the remake. Zoltan, I do need some clones. Lynn, my darn day job has meetings all morning. Don't these people know I need to blog today? Laura, thank you so much for saying that. Rusty, find those album covers! Siv, all links are direct now, which should help. I'm gonna have to watch Wrath of the Titans. I heard bad things about it from some, but the trailer looked interesting. Congratulations to Sophia for her release. Her memoir sounds like it is very touching. Congrats also to contest winners, cover revealers (that cover looks great!) and book releasers! Woot! Although I didn't get to participate myself, I enjoyed going around to different bloggers and finding out their faves. Really fun. It was an awesome blogfest, Alex. I wish I had more time to stop by everyone too. Congrats on the Goodreads list! I liked Wrath of the Titans better than the first one too. Congratulations on securing the top spots! WHAT?! I liked the remake of Clash of the Titans. I think Liam Neeson should be contractually obligated to play Zeus for life. Good music and film reviews, also so pleased your blogfest was a huge success. Congrats to everyone on their new releases. I have read both Sophia's and Karen's books. Congrats on taking the first two spots as well. Angela, glad you enjoyed it. Tonja, he was a good Zeus. LG, that is really cool. I was sorry I was gone for so much of the blogfest day, but the blogs I visited were wonderful. And I've read Sophia's memoir, The Mormon Diaries and it's well worth the read. Fascinating story. You like movies, Alex? How come you've (hardly ever) mentioned this before? Good post, Alex. You do a real nice job on this blog. Well done, Ninja Sir. Best of luck to Sophia. I saw 'Clash' and I don't know if I can overcome that experience enough to see 'Wrath'. Thanks for the nod, Alex. I really enjoyed the party. And though I did get around a bit, I wish I could have made every stop. Congrats on the GR list toppers! The blogfest was (and is, since I'm still visiting participants) a lot of fun, Alex. I'm amazed at the number of bloggers, including guys, who are fans of musicals. Someone should tell Hollywood!! Another successful blogfest! So great to read everyone's posts. Fun blogfest, I am still trying to make the rounds! I'm am curious about Sophia's book. I worked with a family of Mormons in Alaska. I think I was the only one who wasn't Mormon. I learned it was a difficult religion to live by. No caffeine...yikes! I agree with David! So much awesomeness! Sophia's book sounds great. Thanks for letting us know about it! I stopped by a lot of pages with the blogfest and it was cool seeing everyone's fav genres. Definitely some surprises! I wouldn't say that "they won't last", Alex. I think you are safe at the top for a long time. I honestly don't think a lot of people are motivated to vote on those lists. But I do think that people read off of them. So it's a good marketing step in the least. Wow, so much good news going around! Sophia's book sounds excellent. Congrats on the Goodreads success, I think you'll stay at the top! I heard about Sophia's book on another blog too and I've been looking forward to getting my hands on it! It looks like it's going to have some fascinating insights. Like you, I avoided Wrath because the Clash remake was so bad. I've had people tell me Wrath was better but I still avoided it. Maybe I'll check it out when it's on tv. And I LOVE seeing your books at 1 and 2, Alex! What a pretty sight! Sophia's book looks great, and I love the simplicity of the cover. Congrats to all the great news. I love Krya's new cover! Hi Alex - Wow! Lots going on. Unfortunately I missed the blogfest, getting my debut novel launch ready. Thanks for a great blogfest -- it was a lot of fun! And congratulations to Suze, Kra, Tyrean, and Karen!!! I've never heard Threshold -- I will definitely have to check it out -- thanks for the tip, alex! Doh!!! Whooops -- that's KYRA, not "Kra"! I haven't seen Wrath, yet. I liked Clash well enough, but I was never in love with the craptastic one from the 80s either. Congrats to Kyra, Tyrean Karen, and you Alex for the Goodreads ranking! The blogfest was great and I learned a lot about many bloggers. Roland, you surged up recently though! Patsy, just trying to keep it a secret. David, I try to offer a variety. LD, it IS a little better. Patricia, they still wouldn't listen. Ella, yes I was surprised by some of the common picks. Susan, thanks very much. Really appreciate that. Michael, yes it is. But those near the top of my list deserve it more than my books. Jai, set expectations low and you might enjoy it. Thanks for the blogfest it was great! Yay for CassaStar and CassaFire!!! I don't like Worthington either. Sophia's book does sound powerful and intriguing. There are so many great new releases due out this fall, I can't wait! It's wonderful to see so many writers living the dream! Congratulations on the success of the Blogfest. Thank you for running the bloghop! Congrats on your Goodreads success and the blogfest. Wasn't able to participate myself this time - been snowed under this week at work and family stuff but visited a few blogs and the buzz seemed awesome. I am so glad for the blogfest... it was fun to see what folks loved. I met a handful of great people. I like an idiot was reading all the wonderful people who took the time to email, by mistake purged the folder I was going to respond to today... so everyone sorry your stuff is in cyber trash... though thank you! Wrath of the Titans... utter garbage, sad it was so rushed and didn't uphold to the first. I liked the first, I like the guy too.. in Terminator film. The score is probably the best thing to come out the film. Alex, thank you for sharing your blog/blogfest to us all. Congrats to all on the book releases and cover reveals. And congrats to you too, Alex! I have Wrath of the Titans on my Netflix list. I just got Cabin in the Woods today. I'll be watching it tonight! Andrew, then you'll like Wrath even better. Maurice, it was a lot of fun. Jeremy, glad you enjoyed it so much! Christine, I picked it up yesterday. Can't wait to watch it again. It's wonderful to see everyone getting out there and doing so well. Awesome to see all these great books, and that was great news from Suze. Thanks for the shout-out, Alex. Thank you for holding the blog fest, it was a lot of fun! And I found lots of new blogs to follow. I start Wrath of the Titans but didn't get a chance to finish it yet. I hope to soon, surprisingly, I liked it. I thought I'd hate it it's taken me this long to dare watching it, and I only did so because my brother wanted to. The blogfest was a lot of fun. I can't believe how many comments I received. Congrats on the Goodreads ranking. I visited several blogs today -nothing compared with the mass of blogs you visit. I must say the thing I like most today is the new HOBBIT trailer. Peter Jackson knows to bait people. Despite that your blogfest has been extremely successful. That means you know perfectly how to involve people. I like GOODREADS a lot. If you look for rviews beyond AMAZON, GOODREADS is a great choice. Loved the blogfest. Congrats on your top ranking on Goodreads. The cover for Mormon Diaries is outstanding. It's beautiful and mysterious and telling. Congrats on the ranking, Alex! Wow! And those books just keep coming. 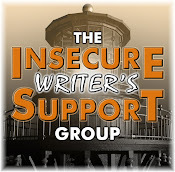 The Genre Blogfest is fun to follow. I'm sort of on the sidelines this time out due to a nervous blogdown, but I'm stopping and reading what others are writing about. I just loved this blogfest. I really did:) It was so fun to see how diverse everyone is. Yet, there was a sameness, too. Plus, so many posts reminded of long ago favorites I somehow forgot I loved. It would be cool to have another blogfest just to see if others changed their favorite genre because someone reminded them of something. So many great books, so little time. Congrats to you, Suze, and all the rest. I actually just picked up Wrath of the Titans. Looking forward to watching it! Mis Jack, glad you enjoyed the blogfest. And Wrath wasn't too bad. I was surprised. Edi, I saw the trailer! Very awesome. And I'm just a Ninja trying to make this world a better place. Ink, you're welcome! And glad you enjoyed the blogfest. Thanks for the awesome shout out, Alex!!! Alex, sounds like it's been an awesome week for you and your friends! Congrats on the success of the blogfest, and thanks for always introducing me to new writers. you're so great about promoting others! and a wonderful idea to send all bloghop participants a reminder! many do it who prob forgot! TL, it has been awesome. Tara, I only had to take a dozen off the list, and that's great odds. Thanks for hosting the blogfest! It was huge success! Sophia's book sounds really interesting. I think I'll put that one on my list to read. Great news about the other ninjas, too! What great news about Suze and Kyra and others! Thanks for sharing Alex. Thanks again for the awesome blog fest! Sophia's book sounds fascinating. Mormon Diaries sounds amazing, and congrats (I'm so jealous!) to Suze for her fantastic first place. You always have such wonderful info to share, Alex. The blogfest was a whole lotta fun! I'm off to check out the interview. Happy Wednesday! I never heard of progressive rock either. Now I'll have to check it out. 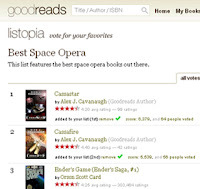 Congrats on the Goodreads Space opera ranking. Also to the women writers you featured. I'm curious to know if Sophia is still an active Mormon after her journey. I've always been an Alma 32 "experiment upon the Word" sort because I'm a science geek and a gardener. Congrats for another successful blogfest!! Woot! You always post such great lists of people to visit, books to check out, and films to watch. Thank you! Sherry and Jemi, glad you had a good time! Helena, there's so much awesome news out there. Sher, send her a Tweet and ask. Lynda, that made me chuckle. Jamie, the new album is beyond their older stuff. Give it a listen. I just saw Sophia's book on another site. It sounds like quite an emotional read. I love the cover, too! Congrats to all the good news you've posted here!! Thanks for the suggestion Alex! I bought Mormon Diaries of Amazon and just started reading it. I was delighted to see her mention in the very first chapter your April A-Z blogging challenge. Seeing as this is technically non-fiction, is there a real blog of her's I could visit? I find discussion on spiritual discovery fascinating, especially as I feel like I am in the middle of one myself. Yeah, gotta be careful about remaking a classic. So very much can go wrong. Hubby and I watched WarGames the other day. That movie's message is still so pertinent today, but the technology and world environment is different I wondered if it would be up for a remake. But I fear they'd ruin it. Wrath of the Titans, looks very spectacular with excellent special effects. Sophia is on my blog too. Congrats to her and her release! You do keep busy! Thank you for stopping by my blog! Enjoyed the review of Sophia's book. Sophia's books sounds interesting. Congrats and good luck to her. Liz, glad you enjoyed it. Avantika, you can contact her by Twitter. I'll send her an email for you. Donna, not sure they could do it right. And it wouldn't be Russia anymore. Been hearing quite a bit about the Mormon Diaries. I'm not sure how the religious community is liking it though. I actually did hop around A LOT! Met some wonderful new blogger friends and managed it hit over 600 followers now ... YAY! Inching my way to a thousand. Had hope I'd make it by now, but my work in Florida kept me away from the blogosphere too much this year. DWei, I think it's a mixed bag. Michael, congratulations! Thanks for visiting so many. Sophia's book sounds very interesting! Thanks for bringing it to my attention! Another refreshingly short comment from me. As per usual, I endeavour to check out your various links. Indeed, Sophia's book certainly arouses curiosity. Progressive rock and the time I went for some "Brain Salad Surgery". I'm soooo happy for Suze - and not a bit surprised. Congrats to all those with books releasing! The Mormon Diaries sounds like an intriguing read. Congrats to Karen and Kyra. I have Sophia's book and look forward to reading it..
Congrats to all the authors with releases! And congrats on your stellar blogfest. I was WORN out from bloghopping. It was fun. It was a fun blog fest! I'm slowly but surely running through the list. Congrats on your Good Reads ranking(s)! The Blogfest was a lot of fun. Keep it simple and visit as many people as you can. Its great to learn more about our fellow bloggers and blogettes by what the little things in life they like. Nicely don! I'll put Threshold on my to-buy list, thanks. The blogfest was awesome, thanks for hosting it. Hi Alex - what a wealth of information you have here - I know where to come to remind myself of books I'm going to be getting. 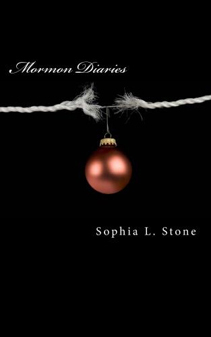 Jessica's review of Sophia's Mormon Diaries gives a good overview. Liesel, I'll look for that movie. Gary, you are just cool. Brinda, it wore me out as well! Donna, you'll enjoy Threshold. And yeah, I would wait. I keep waiting for someone to write a book on how awesome it is to be a Mormon. Maybe I should be the one to do it.